The nature of God has vexed theologians and philosophers for millennia. “Our God is in heaven; he does whatever pleases him,” the Bible tells us. “Because we cannot know what God is, but only what He is not, we cannot consider how He is but only how He is not,” Saint Thomas Aquinas once wrote. And so it is that we can ask why bad things happen to good people, but the only answer is that God wills it so, and His ways shall remain mysterious to us. We may petition the heavens—as Bill O’Reilly did yesterday—to ask why God would allow Bill O’Reilly to be accused of repeated sexual harassment. We may even be angry at God, as Bill O’Reilly is, that God would turn a blind eye to all these aggressive, unwanted advances being made on him. But this, too, is just part of our working relationship with the Lord, and it’s not like there’s some policy against that kind of thing. O’Reilly’s prayer for safeguarding against harassment lawsuits came in the wake of The New York Times’ report that he had reached a $32 million settlement with a former Fox News colleague over sexual misconduct, one of six separate allegations and their corresponding settlements that network made on his behalf before firing him in April. The staggering amount of that settlement in particular prompted O’Reilly’s former coworker, Megyn Kelly, to comment on her former coworker NBC’s Today, where she also refuted his claims that no one had ever complained about him by saying that she had complained. And again, God in his inscrutable wisdom just let it happen. O’Reilly then responded to Kelly by going on Glenn Beck’s radio program, where he read from personal notes he said Kelly had sent him calling him a “true friend and mentor,” all while maintaining this was a politically motivated smear against him orchestrated by the liberal media and, by His inaction, God. O’Reilly also added that it has caused “indescribable pain” to his children who—after witnessing their father choking their mother and drag her down some stairs—have surely suffered enough, oh Lord. Dear, sweet Lord, might you bestow mercy upon these innocents, so that they may not be exploited by others for their own cheap, personal ends? “I urge you to think about what you put in your newspaper,” O’Reilly then told the Times’ podcast The Daily. “Eric Bolling’s son is dead. He’s dead because of allegations made — in my opinion and I know this to be true — against Mr. Bolling.” Tragically, the reference to his former Fox News coworker, whose 19-year-old son died shortly after he was ousted for sending “explicit photos” to female colleagues, did not go over well with Bolling, who responded that it was “beyond inappropriate” for O’Reilly to him into this, given that authorities had concluded his son’s death was accidental and in no way connected to his firing. O’Reilly then issued an apology to Bolling, saying he was only trying to get across the message that “allegations harm kids”—that it’s not right when children are publicly dragged into scandals by morally bereft media figures who are desperately trying to push their own sick agenda. 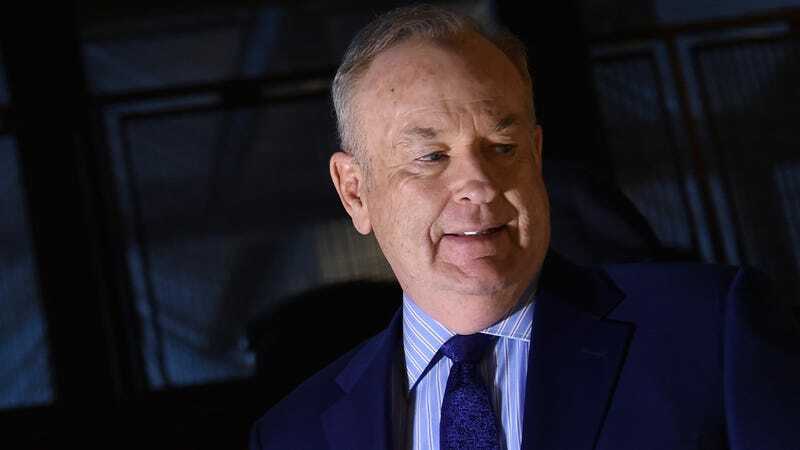 But of course, O’Reilly—God’s personal Job—would be cursed to have his message distorted and twisted by the modern Tower of Babel that is the microphone. Fortunately, O’Reilly added that he has, in these dark times, been able to find some comfort by comparing his own tribulations to that of other people who “have it much, much rougher than me.” For example, Kate Steinle, a woman who was allegedly murdered by an undocumented immigrant, and whose case has been covered in numerous Bill O’Reilly commentaries that you can listen to by becoming a Premium Member of BillOReilly.com, for as low as $4.95 per month. It is there that we, like the gnostics of old, may sit in council and contemplate why God did not do more to protect Steinle or O’Reilly, and why He sees fit to force Himself upon them unbidden when they are just trying to live their lives. But all God can say, in his benevolence, is that hey, these things are bound to happen in this kind of fast-paced universe where humans and deities are always fraternizing. Lighten up, sayeth the Lord. I’m just from a more old-fashioned time.